There is a restaurant dining room serving mainly hotel guests. Breakfast and dinner are served here. All meals are served in the form of a buffet with a choice of menus, including a vegetable and fruit buffet. 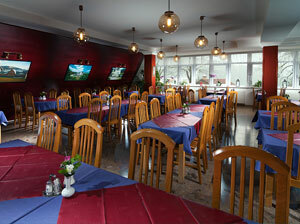 The catering capacity of this restaurant fully covers the accommodation capacity of the hotel.